Richard Meier & Partners has completed its first international residential tower and its first project in Israel. The new Rothschild Tower is inspired by the scale and Bauhaus design principles of its neighbors in Tel Aviv’s White City. Historically architecture in Tel Aviv consists mostly of low scale Bauhaus style buildings designed in the 1930’s. Known as the White City, it was designated a UNESCO World Heritage Site in 2003. Rothschild Blvd runs through the heart of the White City and is an active pedestrian street with a central green space, alleys of trees and a variety of restaurants street cafes and espresso pavilions. Play areas and park benches are fully used day and night. Any design response within the context must respond to the street life that thrives under the filtered light and protection of shade trees. This project is a pure, simple iconic residential, retail and office facility for the city of Tel Aviv. The 37-story tower for Berggruen Construction and Development will be located on Rothschild Boulevard and Allenby Street, one of Tel Aviv’s most distinguished addresses. The fundamental considerations that shape the tower scheme are the quality of light in the plan, views to the sea, and relationships with the existing fabric of Rothschild Boulevard. In the local neighborhood the intention is to integrate a new landmark building as an “anchor” in the heart of Tel Aviv, complementing its nearby modern predecessors in the Bauhaus style design of the historic “White City”. 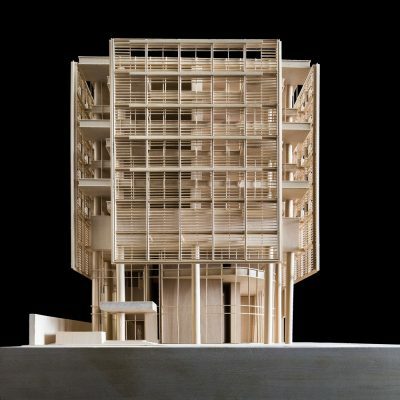 The massing of the tower is simple and graceful, focusing on materials that are light, elegant, and transparent. The tower base, open and transparent, will feature an inviting lobby and retail space. The open plaza in front of the tower will enjoy minimal separation from the street and sidewalk, with new trees at the edge of Rothschild Boulevard separating the public area from traffic. New light and airy glass canopy structures along the ground level street facades and large openings in the second-floor facades featuring a pool deck on Allenby Street and spa on Yavne Street will add new vitality to this famed area of Tel Aviv. The residential building also features a basement wine cellar and lounge. The Retail Building is designed essentially to update/upgrade the original Arcade design of the existing building. The passage will have prominent entrances that serve both Allenby and Yavne streets; the Yavne street entrance will also accommodate an entrance to the 5000 square feet office building above. This dynamic combination will contribute to the continuing growth of Tel Aviv as a vibrant urban place in the spirit of European capitals. Renderings: Studio 89 and DBOX; all material courtesy of Richard Meier & Partners Architects.